Feedback from the 2016 harvest has been great with many customers impressed with the latest innovations on field bins which have added more safety and efficiency while operating. One customer in particular told us that his neighbours were very unhappy with him because the transport operators kept going to their farm where they were loading 75t “C” trains in around 7.5 minutes using a chase bin for the front trailer, a DE Engineers field bin for the 2nd trailer and a DE field bin fitted with a remote operated clutch on the 3rd trailer. The driver stood at the back of the truck cab to operate the “Electro Clutch” (pat pending) on the last field bin and after tarps were rolled on he was on his way in around seven and a half minutes. The operators said that the safety and ease of loading with the DE Engineers field bins especially the one fitted with the remote clutch meant they could shift 11 loads on a 80km round trip with two 72 plus tonne “C” trains in one day. Another time saver with the DE Engineers field bins was the ability to start and stop augers while full of grain without using a hydraulic choke, instead the bins are fitted with a manual choke plates with the rear one positioned so we could adjust the loading rate which was running with a 1000RPM tractor. 55hp “Electro Clutches” (pat pending) can engage and disengage DE Engineers 15″ field bin augers. 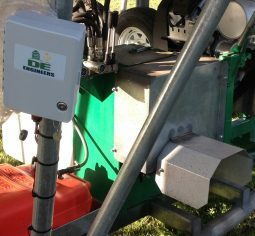 Please note/- DE Engineers field bins are smoother running and more efficient than other makes so DE Engineers 55hp (500Nm) “Electroclutches” (pat pending) may not be sufficient in power to run all makes of field bins so we are manufacturing larger 800Nm and 1200Nm magnetic clutches. 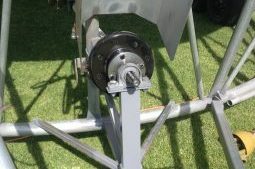 “Electro Clutches” must not be used on Field Bins without a properly tensioned Slip-clutch otherwise damage to the field bin and “Electro Clutch” may occur.